There you have the first bit of weaving done on the Megado! It even has a mistake. Not overly exciting but it sure felt good to me. Its been a bit of a journey to get to this point (besides the trip to go and get the loom). I had ordered the update to my Fiberworks-PCW program before we left and it was in the mailbox when we got home. I like a physical disc over a internet download. Been through too many computer crashes in my time I guess. Bruce helped me with assembling the loom as its not quite like any loom I've had before. He also had taken the loom apart so he was the natural choice for help. There were some parts we got wrong, or used the wrong hardware. Correcting the assembly meant we now had nuts and bolts for other parts again. Oops! We did have some missing bits that Jane Stafford sent me replacements for. Some new parts, like bumper pads, are still on order from Louet in Holland. Its fair to warn you that nothing with regards to this loom has happened fast. Jane was in the middle of teaching back to back full time workshops so getting information and the parts took time understandably. Finally it was as together as we could do for now, so we turned our attention to the loom's module and computer. The module worked when plugged in as the solenoids all fired nicely in sequence. Okay, that's good. Now we are getting into foreign territory and I was learning as I went. I had to find either a small used laptop (which I couldn't find here locally) or find a small newer alternative. New computers have USB ports that you can simply plug in a cord and work with the external camera or other devise you want to use. The loom's module has an older style serial port and the plug used for that looks like the old nine pin printer cords. I had to find something that would 'marry' them together. I wanted to talk with Louet Canada for their best advice and caught them away at Convergence, then closely followed by their annual inventory on their return! More waiting but I wanted to get this done right. I went to a local technology store, Future Shop, and found a young lady in their computer department who was simply great. I brought the module in with me so they could see the unit and what it needed. She carefully listened to me and what the goals were and then we set out to find all that was needed. We got a (short) serial to USB cord and then found an extension 'USB to USB' cord so I can move the computer closer next to me while working. So far, so good! I think I've shown this picture to you before but it really does fit in nicely at this point of the story. The computer is all set up with the software and I'm mostly familiar with the majority of it....up to the part that governs the weaving process. Before we get to that part I had to learn all about COMM ports (that's how they write that word... I'm not shouting :) The COMM port is the door way through which your computer allows data in and out. Some doors work better and luckily for my little computer, there is only one ( and only one available) and its COMM port 3 and it works! I like the way the computer proudly tells me the door is open. Okay, so far, so good... next up is learning the steps for using the portion of the Fiberworks program for weaving. It meant reading, and rereading the manual and sort of doing 'fake' weaving. 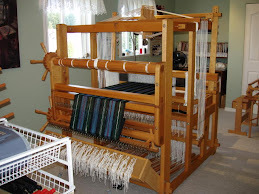 There is no warp on the loom but you treadle along and the computer doesn't know you don't throw a shuttle. This went okay but there's nothing like the real thing. So planned a warp for two scarves and decided on a simple point twill pattern that uses ten shafts. I thought for the first project I should keep the draft simple so I can concentrate on the methods and not get too complicated. The first mistake I made was the silk yarn I chose. I don't know where my mind was at. Its a cone of 20/2 silk I got somewhere along the way and its not as tightly twisted as my usual from Treenway silks. I wound the warp in two large bouts, 6.5 yards long (two scarves both 72" long, 12 inches either ends for fringe allowance, take up, loom waste and some samples). I counted carefully and then decided to wind a couple extra warp ends just in case. Not having warped a Megado before, I decided to look at it like a larger Spring loom and I followed the same procedures, and it all worked nicely. Here the two warp bouts are waiting to be spread in the built in raddle. At the back of the loom now and I'm starting to wind on. I used a brand new roll of crisp brown paper for the inaugural warp. This is where the first mistake came home to roost. The yarn halo'd and grabbed its mate next door. Crap. I fought with it until I realized an easier fix. Separate the lease sticks! Since they could slide on the support strings .....easy peasy! The rest of the warp beamed on just fine and no more clingy issues. Next up, threading. Its a simple ten shaft point twill. Well, maybe the process will become simple in time as I get used to the shaft arrangements but for now, not so much! The shafts are set *very* close together and so when it comes to reaching for heddles, its very hard to see where you are reaching to and what you actually come out with. I had to double check and count every one before and after threading and caught a mistake or three along the way. Oh by the way, mistake number 2 was, despite winding two extra ends, I was still one short. Threading was finally done and sleying was up next. I used a 23 inch , 15 dent reed for my 30 epi. That went much better except for the missed dent in the middle. Mistake number 3. Fixed that up and then laced on. Then, I held my breath and turned on the computer and module and using 8/2 cotton, wove the header you saw in the picture at the top of the post. Then I took out my weft yarn and wove the border. I didn't know how to shift from border to repeats so I deleted the border portion and then clicked on 'repeating loop' and got to work! It was going well! So I called Bruce to come and see the loom in action. Mistake number 4: showing off. Closely followed by, I don't know why there is suddenly a mistake and then quickly learning the function 'unweaving'. Well, it had to happen sooner or later right? This is where mistake number 1 came back to haunt me. The silk fused at the edges and so won't unweave. Next time I sat down on the bench I rolled the warp ahead and simply started over again. I got quite a bit done until I saw a double weft shot in one shed. It seems the program suddenly decided to remove a tie up square. Why I have no idea! Mistake number 5. This is where I quit yesterday and went and wove on the Spring loom for a time. It likes me and behaves itself. Needless to say the learning curve has been steep, and complete with speed bumps that I placed there myself. I'll keep at the warp and if it all ends up as samples, then its not wasted. Well its nice to know that if I need a time out, there are other options to play with in the studio. This has been a lot like going back to school! I did mention in my last post that there was more crazy busy times to come and we just came through a couple more of those days! The fall rainy season started with a vengeance right after they completed the work so all the planned sanding and protective finish coat didn't happen. The next summer, for various reasons, it didn't happen again. I think it was all about our attention and money being redirected to the drilling of a new well and then all the plumbing that goes along with that! A good reason, but still the deck needs to finished properly to protect the investment. Various health and joint issues for both of us meant that kneeling, and a lot of bending were pretty much out for both of us and we would have to either hire painter to come and do it or simply learn to like the grayed cedar look. Lynnette and Ngaire had come to help with getting all the new cords back onto my Woolhouse Tools loom recently. This was amazing all by its self.... but when they were leaving that day, they also volunteered to come back and paint the decks! No small feat as between upper and lower portions, it measures up as roughly 1400 to 1450 square feet! (just the size of it all has been an intimidating factor for Hubby and I). They assured us that they had a system of the three of them working together in a 'tag team fashion' and they could get it done in two days and with two coats. We were speechless at this generous offer. There is only a short window of warm sunny weather to get it done before the rains fall again and so we booked it for mid August, amidst busy schedules for both families. We crossed our fingers that the weather would hold and also not be too hot. They arrived bright and early this past Thursday and got to work right away while we had shade around the house. We had had the decks power washed by Colin and generally cleared off. We had lost all the grayed wood and were new cedar wood bright again. Choosing a colour for the semi transparent stain was difficult as we did not want to go with the orangey cedar tones or the brassy yellow tones. We choose Behr brand stain in terracotta and even lucked into a sale, with a mail in rebate! Out of ten gallons we bought, it was like we got two gallons for free. The weather held and were some of the hottest days this summer! They moved from place to place depending on the sun and worked in shadier spots as the day progressed. Being surrounded by tall trees was an advantage for once. Here's Lynnette and Bruce working on the front porch. Michael admiring his handiwork on the stairs. Ngaire, being a garden faerie sitting in (and on) the marjoram under the stairs. Sorry for the fuzzy picture but its the only one I have of her working for some reason. The second coat went on much quicker and Michael started about 7 am the second morning! Its a good thing too as it turned out to be an even hotter day that the one before. They were done ahead of lunch time and I had cold cuts and salads all ready to go. That was my main job ... feeding and refreshing the troops! I had made up a lot of salads and soups from scratch and even the ice tea was home made. We have all the hanging baskets back up again but keeping the decks clear for now. We look like we're ready for what is left of summer in grand style! The second Drall scarf is under way using a magenta as weft. I really like this one! The two rich colours really compliment each other. I'm still not sure what colour I will use for scarf three but I will dig through my stash and find another equally rich gem. The Louet Spring is the only loom actually set for weaving right now and its great to be able to grab a few minutes from time to time. One of the benefits of no naked looms! The Woolhouse had all its cords set and so I got busy planning a warp. I've gone back to some older ideas and revisiting some drafts done before.... or at least their updated versions. I want to do a waffle weave again. Years ago when I was a newbie I wove four shaft waffle weave towels for all my family for Christmas. They came off and went into the wash and that''s when I learned all about shrinkage and that waffle is greater than 10%. The 'gifts' were too large for dishcloths, and too small for towels and every one still thanked me regardless. So its all beamed on now and I'm busy threading away and looking forward to weaving on this loom again. Its been awhile! I have a draft in mind for the Megado and will start on that warp once the Woolhouse is up and running. I'm trying to consolidate my efforts rather than scatter it everywhere. So why is this all taking so long? A routine test did spot something else we didn't know about and so that began a series of Doctor appointments and more tests. As of last Wednesday, he was given the "all's clear" by a specialist. Boy, Life sure becomes much sweeter after an experience like that! It puts everything in perspective and shows you what is truly important. We also have had house guests too. Our son and daughter in law came for a couple of days and of course this means, Ethan came too. His first 'road trip' and it was to Nana's house! We had a great time just relaxing and chatting. Ethan was really good and for the most part was smiling and talking away to us. I discovered I can still do a speedy diaper change (you have to with little boys!) and I can still cook breakfast with a baby on my hip. Dad was loading up the car and Mum was in the shower so Ethan and I made French toast. Hope your summer is going well! I've heard from a friend in New Zealand that their weather has taken a spring like turn, so there not a lot of summer left for us. Enjoy it while you can!